On Thursday, Facebook COO Sheryl Sandberg repeated a Facebook talking point that’s beginning to wear thin. Asked if Facebook is a media company, she resisted the characterization. “At our heart we’re a tech company, we hire engineers. We don’t hire reporters, no one’s a journalist, we don’t cover the news,” she said. Facebook does not want to be viewed as a media company, which would bring a responsibility to the truth and potential accusations of bias. (Being a mere tech platform that surfaces content via algorithm does not). Admitting Facebook is a media company would require Facebook to take responsibility for its role in the spread of fake news, propaganda, and illegal Russian meddling in the U.S. election. Are you the country’s largest source of news? Do you sell ads against content? Facebook users spend an average of 50 minutes on its suite of products each day. Last year the company showed those users $26 billion worth of ads. Do you commission publishers and content providers to make original content for you to distribute? “Facebook’s head of global creative strategy and CollegeHumor co-founder, Ricky Van Veen, has been making the rounds among publishers and other content producers to source, develop and fund original shows for Facebook,” Digiday reported earlier this year. Facebook also pays publishers, including WIRED, to create videos using Facebook Live. Do you have a massive workforce of content moderators? Facebook plans to add 3,000 people to its current workforce of 4,500 people who review videos and remove the ones they deem inappropriate. Facebook has elaborate policies for the types of content allowed on its site, some of which have come under criticism. “Facebook’s rules stand in sharp contrast to the United States’ First Amendment protections of free speech, which courts have interpreted to allow exactly the sort of speech and writing censored by the company’s hate speech algorithm,” ProPublica reported. Do you work with fact checkers to suppress false news and hoaxes? “When anything is flagged as false, a third party—I don’t think anyone would want us to do this—is checking, and when they go to share that article, we’ll give you a warning—hey our fact-checkers have marked this as false, and it will dramatically decrease distribution of this article,” Sandberg said Thursday. Does your founder and CEO more or less admit it? “In his interview, Zuckerberg said Facebook ‘is not a traditional media company,’ since it doesn’t write the news that appears on the platform. But he admitted that the network ‘does a lot more than just distribute news, and we’re an important part of the public discourse,'” Fortune reported. Have you partnered with a media company to attract viewers to your own livestreaming platform? Sandberg’s interview with Axios was part of a series called “News Shapers.” It was streamed on Facebook Live. 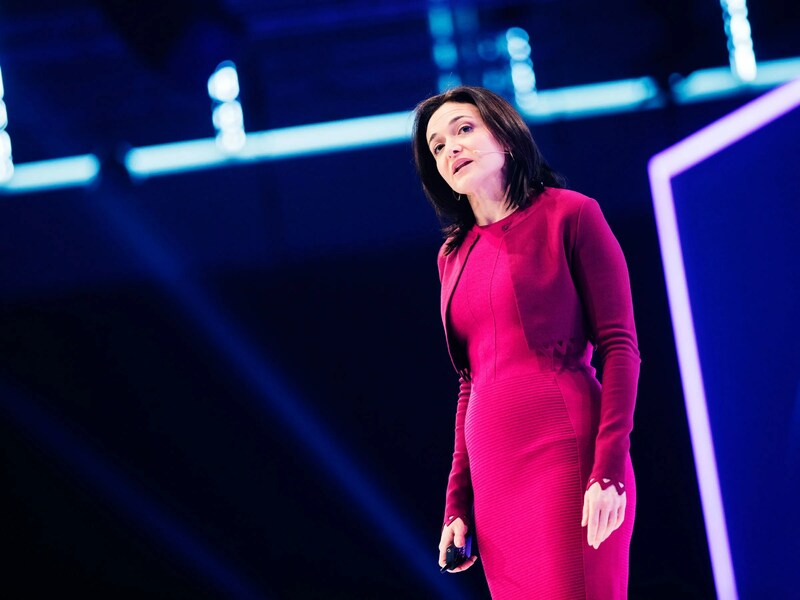 Sheryl Sandberg speaks at the digital fair dmexco in Germany.